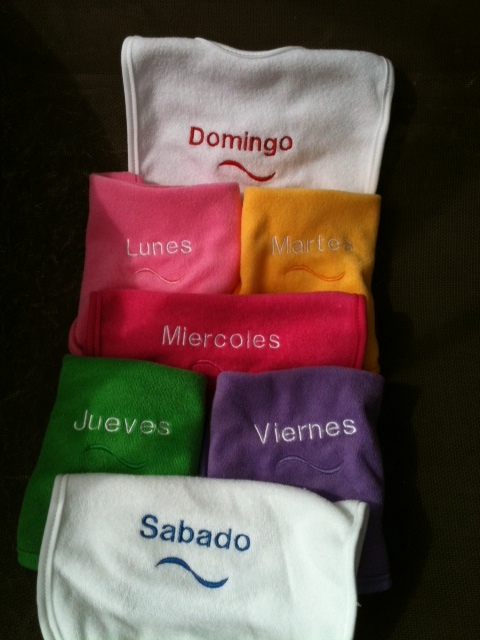 A Tica friend asked me to embroidery the days of the week bibs for a baby that will soon be born in the family. They are nothing fancy, just plain and simple! Can’t wait till she sees them….. Took a field trip yesterday to San Jose; we had been told the Christmas lights were a sight to see; nada, saw very few; and we were told there were lots of street vendors, very few of those too. Altho’, I think you could buy any kind of cell phone on the street you wanted! Thursday morning, yes, Thanksgiving morning, we received an email from our credit card fraud department! Yep, someone tried to use our credit card to go to Berlin…..
And we now know of another person that the same thing has happened to….same issuer of the card: American Airlines credit card….. I do think this happened when I traveled to the states….ho hum…..
Big, big sigh – yep, we’re very thankful for the Fraud Department! Of course, it makes you leery of using it – and of course that card is no longer able to be used….. So readers be aware! Sort of scary knowing someone out there attempted to use our card! Maricela and Nazareth visited last evening. She’s headed to the Clinica today and will clean tomorrow. I had just popped some corn, the old fashioned way, you know, sort of like Smith and Barney! Shared with them and even sent some home with Nazareth. Dylana is at a football (soccer) tourney this week. Apparently there was another earthquake here during the night….we slept thru it! AGAIN! I guess it doesn’t faze our dogs because no one made a whimper. Still recovering from company being here….the older I get, the longer it takes to recover! Used to be able to recover in a day or two, now it seems like it takes days!!! But, I really, really enjoy having company! It was sad when they leave; but I do realize I have good friends all over the world! Need to start thinking about Christmas…..
Maricela and the girls have Christmas lights out and have hung some ornaments on the large cactus in the front of their house. We went down there Friday night for the “lighting of the lights!” And they sang and danced to Jingle Bells! It was so darn cute!!! The girls will be helping me decorate the trees in a couple of weeks. Maricela said they’ve never had a Christmas tree! I have some stockings that I’ll be putting their names on too…..I told Maricela she could not come to see our trees, yes, I put up two trees, about 6 feet apart; one inside and one outside! She can come when we turn the lights on! When I was in the old country, I bought two felt kits of ornaments so the girls can make some ornaments too! It will be fun!!! If we’re lucky, Mark will go into town and get us pizza! We’ll play Christmas carols and decorate like mad fools! Off to hang out some clothes! We took Joanne and Velma to the airport this morning to catch their flight to Orlando; and then they fly on to Nashville. Sure hope they make it. It was going to be a tight squeeze between their original flight and their connecting flight. Visiting us is so different than staying at a resort; you actually get “the feel” of living like a Tico (Costa Rican). We ate out a lot, saw a lot, shopped a lot, and we were able to introduce them to a lot of our friends. They decided to get rid of all the colones coins and gave them to Dylana and Nazareth! They were excited – Dylana ran into their house and immediately wrote a thank you note! They are such sweet girls….won’t be long and they’ll be helping me trim the Christmas trees! When we arrived home from the airport, all three dogs ran around looking for Joanne and Velma! They’ve walked around with forelorn faces ever since. Poor babies. Can’t decide if the December winds have arrived early or not – but I was able to get 2 washer loads of towels dry and a set of sheets! I try to NOT use the dryer unless it’s a necessity. Mechanic had to go to San Jose to get a special wrench because he couldn’t get the tire off the car to see what the actual problem is….some people get to dream of sugar plums….we’re dreaming of dollar signs, er, I should say, colones signs! They should be landing in Orlando about now! Such a beautiful day to fly – lots of sun and no rain clouds – at least so far here anyway. I know they’ll both be happy to arrive home! Velma had an excellent experience at the dentist at Denta-Vac! I’m sure she’ll share it with all of you. I’ve had a wonderful time with friends being here. Have re-visited places to show Velma and Joanne and it’s brought back fond memories of when other friends have visited! Ahhhh, good times. Friends mean the fun times! Then there’s the friggin’ vehicle!!! Old Bessie basically died on us when Terri visited. The “new vehicle”, that is still nameless, has been excellent up to yesterday. Noticed a sound coming from the rear end….headed home from Sarchi; Mark immediately took it back into town to visit the mechanic. Supposed to get a call back today around 10:00 a.m.; please keep your fingers crossed that it won’t be major or cost too many colones to repair! Velma was supposed to go back to the dentist today – Joni offered to drive her there because she wants to know where it is; her fee for doing this is some Hagen Daz ice cream!….which happens to be located fairly close to the dentist! So, we’ll be headed to Escazu this afternoon. Poor Joanne – signed up for international calling while in the states….oops! She got a text from AT&T this morning that she has incurred $250 worth of roaming charges! YIKES!!! Her phone is now turned off! Tomorrow we’ll go to the Feria where Gabriel from the organic coffee farm is getting me some raw peanuts. Then I’ll fry the peanuts – pop some popcorn and mix the two together and pretend that I’m back at Terri’s eating her famous peanut/popcorn snack! Hate thinking that their visit is coming to an end on Saturday. It’s been fun….except for the damn car! Actually, keep your fingers crossed that our car is back by then. The sun has been a tad slow on coming out this morning; but it looks like the clouds are clearing and it will be another wonderful day in the neighborhood. Friday morning Maricela is coming to fix breakfast for us! YUMMY! Great day to start the day!!! Joanne just came back from a walk down the road. She saw a man at the bus stop and since she can’t speak Spanish, she tried using sign language! LOL Gotta love my friends! Today was the big day for Velma to return to the dentist at Denta Vac in Escazu. We left around 9:30 ish a.m. and stopped at the Feria in town. Ran into lots of people I knew….that is always fun!!! I think it was a contest between Velma and Joanne on who could buy the most! We came away from there with lots of veggies and fruits. Then off to Escazu. Stopped at a great Mexican restaurant for lunch – and I promise, the next time I write about this Mexican restaurant, I WILL REMEMBER THE NAME OF IT! It’s near the Santa Ana/Belen exit off Ruta 27. As always, the food was excellent. Decided to hit a Pequeno Mundo to find a new laundry basket since mine cracked….have to quit leaving it in the sun! First Pequeno Mundo didn’t have it; went to another one and they didn’t have it! All I want is a friggin’ plastic laundry basket! Will hit the stores in town tomorrow and see what I can find. Denta Vac called as Joanne and I were checking out and Velma was done!!! Alas, another appointment next week! She’s grinding her teeth at night and will have to wear a mouth guard to protect her new “front teeth”. After that we headed to Multi-Plaza; Velma was desperately looking for a new bracelet. Found the perfect bracelet and then there was a ring that sort of matched it, that said, “please buy me and take me home!” So she did. Went to Cemaco looking for a laundry basket – none there either….so we got some ice cream. Ice cream cures all, right! On the way home it began to rain….by the time we got to Atenas, it was really coming down. The streets were flooded in low areas. Around Cruz Roja, the CAJA Clinic and in front of Kay’s….it was virtually a river in the street. Places on each side of the road we live on were full of rushing water. Made it home safely….a full day, tired but it was fun! Oh, I forgot…..on the way into town, there was a tire lying along the edge of the road….I want to “collect” some old tires, paint them and use them as planters. As Mark was unloading the car with our many purchases today, he got to the bottom of the pile and found the tire! The look on his face was priceless!!! For awhile I let him think I bought it…but finally gave in and said it was a “find” along the road! Very productive day…well, it was a financially productive day for Velma in the “Spending Department”. Pura Vida…..love having my friends visit!! !